The phenomenon of monarch migration in North America is well known, and quite extraordinary in the insect world. There are no other insects in the world that migrate twice each year for close to 3,000 miles. Monarchs living east of the Rocky Mountains in North America fly south each fall, gathering in central Mexico's Oyamel fir forest for the winter. Millions of monarchs gather in the this forest area, covering the trees so densely that branches break from their weight. Scientists aren’t sure how the butterflies navigate to a place they have never been. No other population of monarchs migrates this far. The monarch butterflies that emerge from chrysalides in late summer and early fall differ from the previous generations. These migrant butterflies appear the same but behave quite differently. They will not mate or lay eggs. They feed on nectar, and cluster together during the cool evenings to stay warm. Their only purpose is to prepare for and make the flight south successfully. You can see a monarch emerge from its chrysalis in the photo gallery. Environmental factors trigger the migration. Fewer hours of daylight, cooler temperatures, and diminishing food supplies tell the monarchs it is time to move south. In March, the same butterflies that made the journey south will begin the return trip. The migrants fly to the southern U.S., where they mate and lay eggs. Their descendants will continue the migration north. In the northernmost part of the monarch's range, it may be the great grandchildren of the migrants that finish the trip. In 1937, Frederick Urquhart was the first scientist to tag monarch butterflies in a quest to learn about their migration. 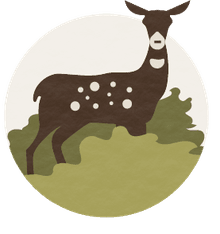 In the 1950’s, he recruited a handful of volunteers to help in the tagging and monitoring efforts. Monarch tagging and research is now conducted by several universities with the help of thousands of volunteers, including school children and their teachers. The tags used today are small adhesive stickers, each printed with a unique ID number and contact information for the research project. A tag is placed on the butterfly’s hindwing, and does not impede flight. A person who finds a tagged monarch can report the date and location of the sighting to the researcher. The data collected from each season’s tags provides scientists with information about the migration path and timing. In 1975, Frederick Urquhart is also credited with finding the monarch’s wintering grounds in Mexico, which were unknown until that time. The site was actually discovered by Ken Brugger, a naturalist volunteering to help with the research. Read more about Urquhart and his lifelong study of monarchs. Remarkably, scientists discovered that migrating butterflies actually gain weight during their long journey. They store fat in their abdomens, and use air currents to glide as much as possible. These energy-saving strategies, together with feeding on nectar throughout the trip, help the migrants survive the arduous travel. 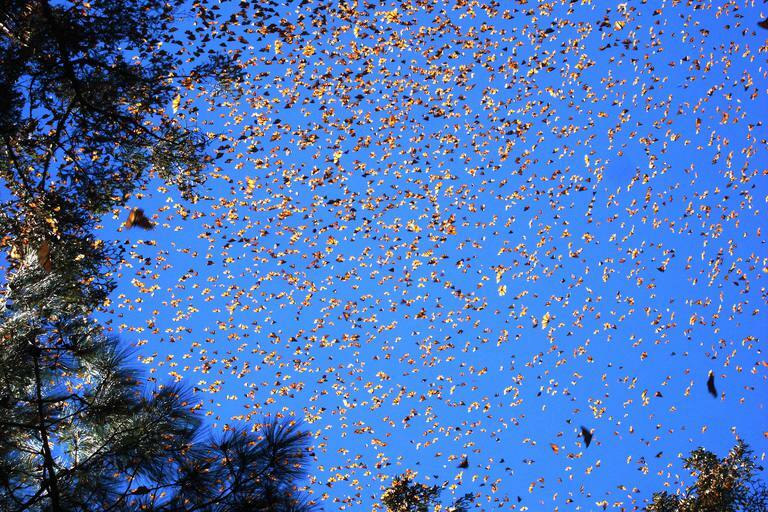 The monarchs arrive at their Mexico wintering grounds en masse in the final days of October. Their arrival coincides with el Dia de los Muertos, or the Day of the Dead, a Mexican traditional holiday that honors the deceased. The indigenous people of Mexico believe the butterflies are the returning souls of children and warriors.